David Cooltions imagined a brand new Surface Phone concept, shown below. We’re dealing with a smartphone with a big display, that also features a touch keyboard accessory of sorts, even involving a set of numeric keys and a mouse-like area. The Microsoft Surface Phone packs a 5 inch display, most likely a Full HD one, plus a 1.5 GHz quad core CPU, probably a Qualcomm Snapdragon unit. There’s 2 GB of RAM on board, a touch case, as the designer calls it and 16 GB of storage. 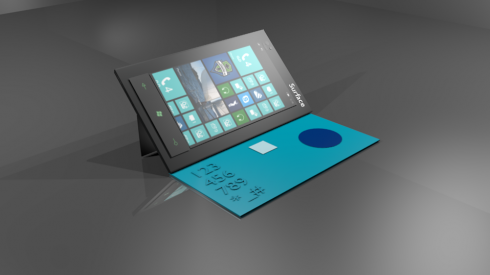 The facade of the phone is rather flat and the Windows Phone buttons are separated from the main body for some reason.